The common cold often affects the eyes, causing a condition called viral conjunctivitis, or "pink eye," as it is commonly known. The eyes often turn red, burn and have a sticky discharge. Doctors may treat this condition with antibiotics. Symptoms may worsen before they improve, causing discomfort and matted eyelids. Knowing some of the ways to treat the sticky discharge will aid in comfort and may help ease symptoms. The eye discharge may dry on the eyelids overnight causing the eyelids to stick shut. A warm compress held on the lids with gentle pressure may loosen the dried matter and allow the eyes to open fully. Throughout the day, the eyes may feel achy and will likely have a sticky buildup, particularly in the corners. Cool compresses held against closed eyelids may help relieve symptoms. The person may then wipe away the sticky eye discharge. Repeating the application of cool compresses throughout the day may continue to improve comfort and keep the eyes clear of matter. Over-the-counter artificial tears may help with viral conjunctivitis. The drops will ease surface irritation from the infection and will help clear the tear film and mucous in the eye. Frequent use may improve comfort and clear out the sticky discharge. An option is to place the drops in the refrigerator so that, when placed in the eye, the drops offer a cool relief from irritation. Artificial tears are safe for most eyes, though if a person has any known allergies to preservatives, she should consider using preservative-free artificial tears to prevent a reaction to the drops. 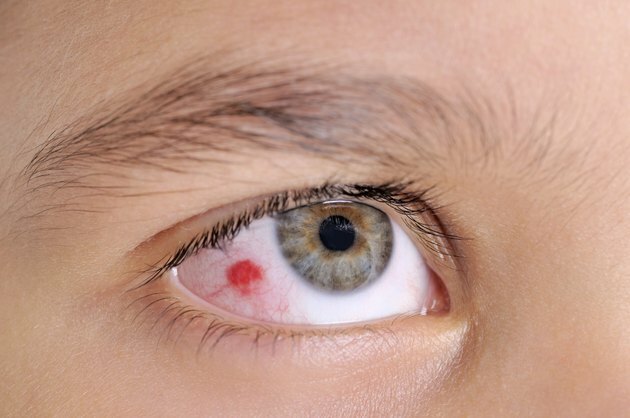 Most people with viral conjunctivitis notice the condition slowly improve within several days. However, severe cases of viral conjunctivitis that continue to worsen require a visit with an eye care professional. Doctors may treat the infection with steroid eye drops or antiibiotics. Since the steroid eye drops may slightly improve inflammation, the drops may also help reduce the amount of eye discharge caused from the condition.